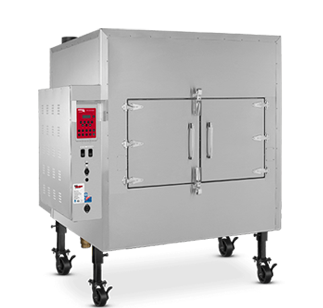 Fast Eddy's by Cookshack easy-to-use commercial barbecue pits are 100% wood-burning pellet smokers with Cookshack's exclusive IQ5 technology for precise temperature control, two-stage smoking and hot holding, making them a great choice for BBQ joints, busy restaurant kitchens, mobile caterers, and outdoor concessionaires. The FEC range burn food-safe hardwood pellets to generate cooking heat, smoke, and the all-important smoke ring, without the aggravation of drying gas, dirty log piles or lots of hot ash to dispose of. BBQ pellets fed from hopper to offset firebox by auger mechanism. Electric hotrod ignites pellets at start-up only, thereafer firepot topped-up by auger. 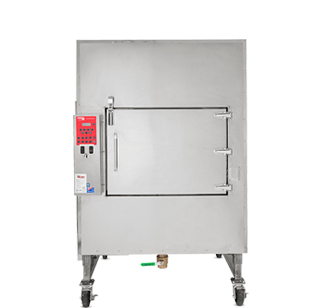 Ovens get up to temperature in 10 to 15 minutes, depending on size. 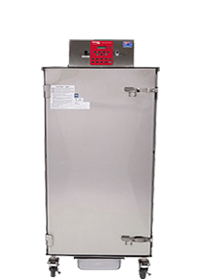 Digital control balances pellet flow and combustion fan speed for oven temperature management. 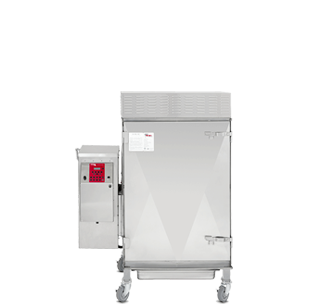 Convection fan for even distribution of heat and smoke within oven. Designed to be used indoors under commercial extraction, or outdoors. Minimal ash, without hot embers. Minimal electricty use; low running costs. Gas-fuelled log-burning smokers have never won a barbecue competition. 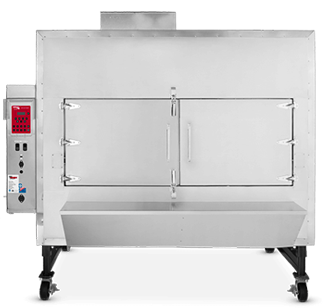 Competition pitmasters only use wood products for heat and smoke. Just like 100% wood-burning, competition-winning Fast Eddy's smokers do!